Mark Dewey came on in the ninth inning of this August 1993 game for Pittsburgh and he set the Cubs down in order to pick up the save, The Pittsburgh Post-Gazette wrote. In his third season with major league time, that was a first for Dewey. "It's nice," Dewey told The Post-Gazette. "It's the first time I've had an opportunity to save a game in the major leagues." Dewey went on to save seven games for the Pirates that year. He also went on to see time in three more major league seasons, including a career high 78 games in 1996. The reliever saved just one more game after that. Dewey's career began in 1987, taken by the Giants in the 23rd round of the draft out of Grand Valley State University in Michigan. Dewey started with the Giants at short-season Everett. He made single-A Clinton in 1988, then AA Shreveport and AAA Phoenix in 1990. He also made major league San Francisco in August 1990. He got into 14 games in relief for the Giants that year, posting a 2.78 ERA. Dewey spent 1991 back in the minors, first at AAA Phoenix and then with the Mets at AAA Tidewater. He went 12-3 at Tidewater, with a 3.34 ERA working in relief. Dewey returned to the majors with the Mets in 1992, getting into 20 games, with a 4.32 ERA. He then moved to the Pirates for 1993, getting into 21 games and saving those seven contests with a 2.36 ERA. He got into even more games in 1994, 45 of them. He gave up the game-winning hit in a June game. "I really don't know where the pitch was," Dewey told The Associated Press after that June loss. "When a guy hits the ball, it's hard for me to tell. But he hit it hard and wherever it was, it wasn't in the right place." Dewey returned to the Giants for 1995 and 1996. He got into 27 games in 1995, then those 78 games in 1996. He went 6-3 in 1996, with a 4.21 ERA. His on-field performance was overshadowed for some by his off-field performance at a July game where his team showed solidarity for those fighting AIDS, according to The San Francisco Chronicle. Described as a fundamentalist Christian, Dewey did not participate in the 1996 event, causing a stir. Dewey didn't return to the field in 1997, in the majors or the minors. He's recorded as playing again in 2001, 11 games at AAA Nashville with the Pirates and then one final time in 2007 at independent Aiken, ending his career. 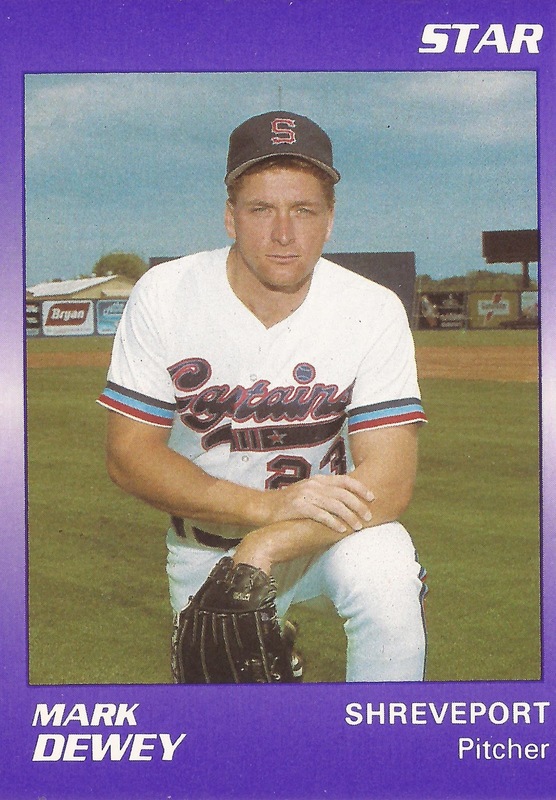 Dewey has since gone on to a minor league coaching career. He managed at independent Washington in 2010 and 2011, then served as pitching coach at high-A Brevard County. In 2016, he's slated to be pitching coach at rookie Helena.